Good morning and Happy New Years Eve! Well this Saturday I woke up and forced myself to do my strength training. I stuck to my goal at least for this week and strength trained 3 days this week. I will tell you my legs were sore Monday from working out to Jillian Micheal’s and my arms were going to fall off on Wednesday from doing the new Jackie Warner 30 Day Fast Start. Jackie’s program is a pyramid workout. Meaning you start out with one rep of the exercise then do it two times and then three and so on until you hit 10. Wednesday, I had a hard time making all the reps, 55 total for each exercise, but I managed through it. I went to do it again on Friday and I could barely do the reps, my arms were still sore from Wednesday. I just love that kind of pain! Jackie has 6 circuits for upper body and 3 for lower and 3 for abs. The workout is broken down into two separate workouts that you can do either together or on separate days, I chose to do them both on the same day, big mistake on my part, I hurt everywhere. The lower part doesn’t bother me so much, but the arms are killers. If you want toned arms and tight abs, I highly recommend this workout. Trust me you will feel the burn. What I like about Jackies workout is she shows you the exercise first, goes slowly and she is encouraging. Comparing her to Jillian Micheal’s, I like her so much better. I personally think Jillian got to big for her britches, and when I have done her last couple of DVD’s, I didn’t feel like I was doing proper form and she spent too much time talking with the girls in the back, and she moved like a crazy person. Jackie is calm, positive and informative. I really like her workout, no matter how much she tortures me! After my workout I deserved a treat, not to mention I was starving! I did this with one cup of coffee in me. 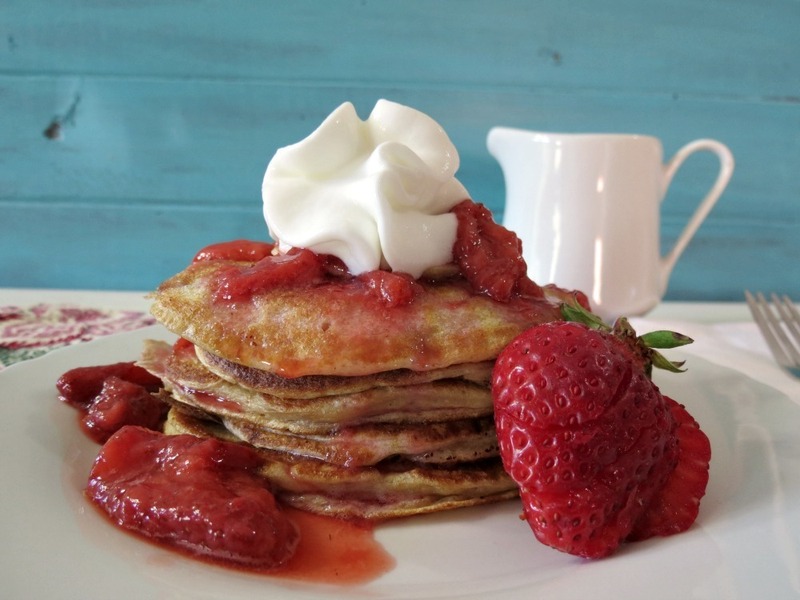 So for breakfast I had a wonderful healthy Strawberry Shortcake Whole Wheat Pancakes. OMG! 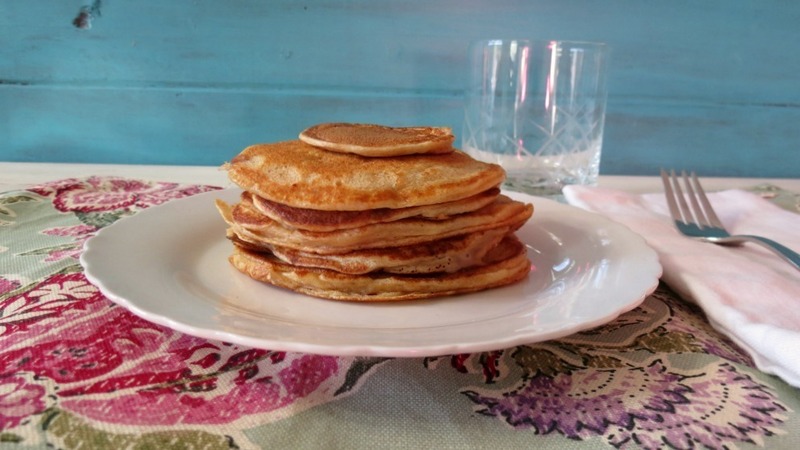 I have to tell you I think these top my other pancakes I have made! It’s like eating dessert for breakfast. 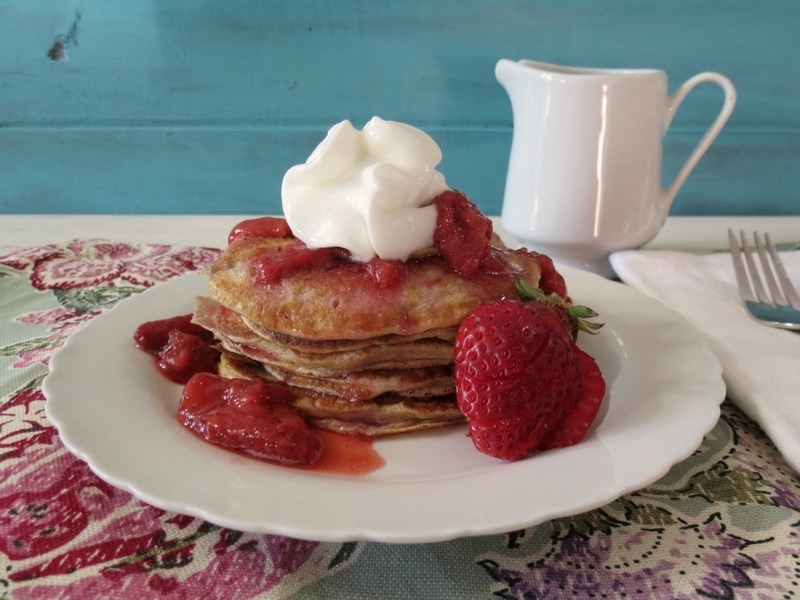 I loved this so much I went to Trader Joe’s and bought some frozen strawberries so I can make this again for breakfast tomorrow, but next time I’ll add two cups of strawberries instead of one. These are simply the best! 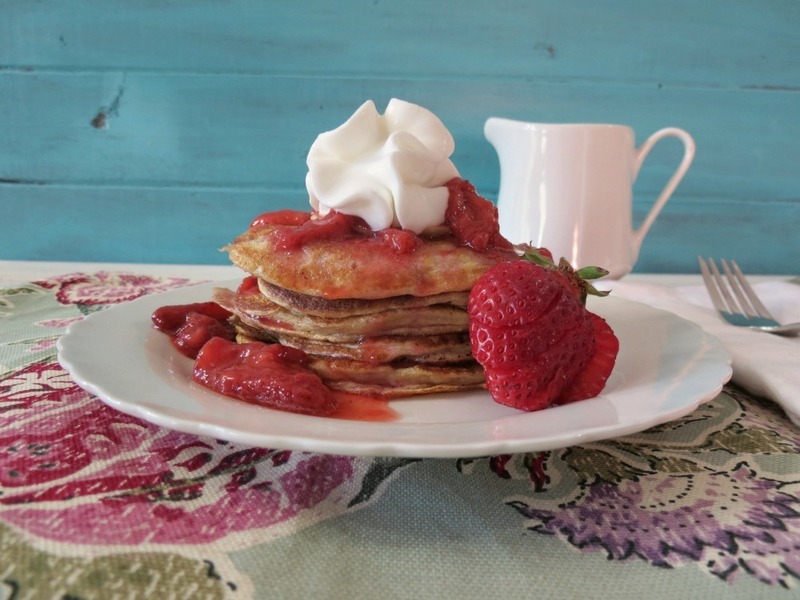 These pancakes are so light and fluffy and the strawberry sauce is so darn good! I used an almond extract in the pancake batter which really brought all the flavors together. I topped it with a whip cream for fun! It was all melty all over the warm pancakes, you’ll see it melting in the pictures. So good, all drippy and delish! Mmmm, so perfect! I swear I could eat these pancakes anytime of the day! Love how healthy they are, all full of protein and fiber!! Guilt-free and will keep you full until lunch! 5.) Spray Skillet with cooking spray and place scant 1/4-cup batter onto skillet and cook till bubbles start appearing through the top of the pancake and then flip. For topping: Place 1/2 cup strawberries in the microwave, and cook for 30 seconds, smush strawberries with a fork. Once completely warmed, place over top of cooked pancakes. 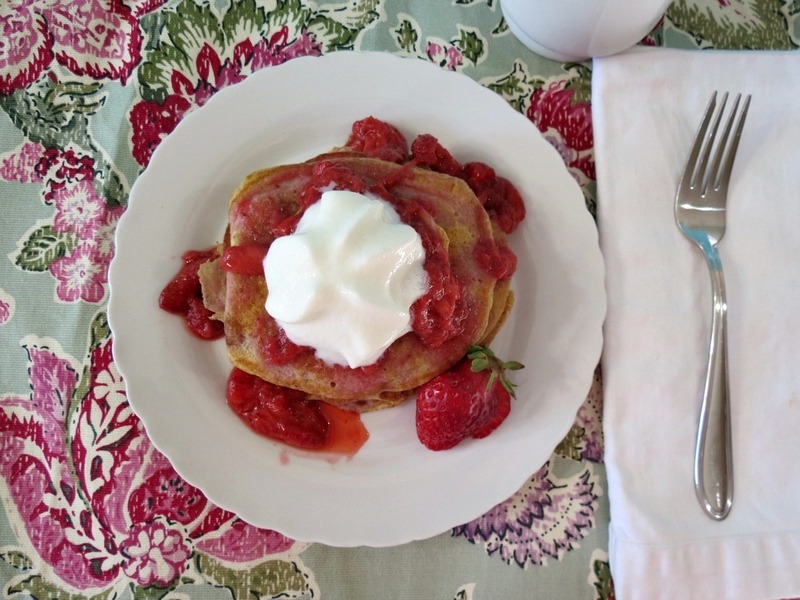 I’m telling you I am not steering you wrong, if you’re a strawberry shortcake fan, you must, must make these pancakes. They are out of this world!! Well I hope you all have a wonderful New Years Eve, be safe, don’t drink and drive and most of all have fun! For me, I have no idea what were doing. Normally we stay in, eat appetizers, drink champagne and watch a movie and try to stay up till midnight. We shall see what the evening brings! Happy New Years my friends! That looks like a wonderful stack of pancakes. I love the idea of putting freeze dried strawberries right into the batter for a real strawberry punch. Have a great New Year!! They are so soft! 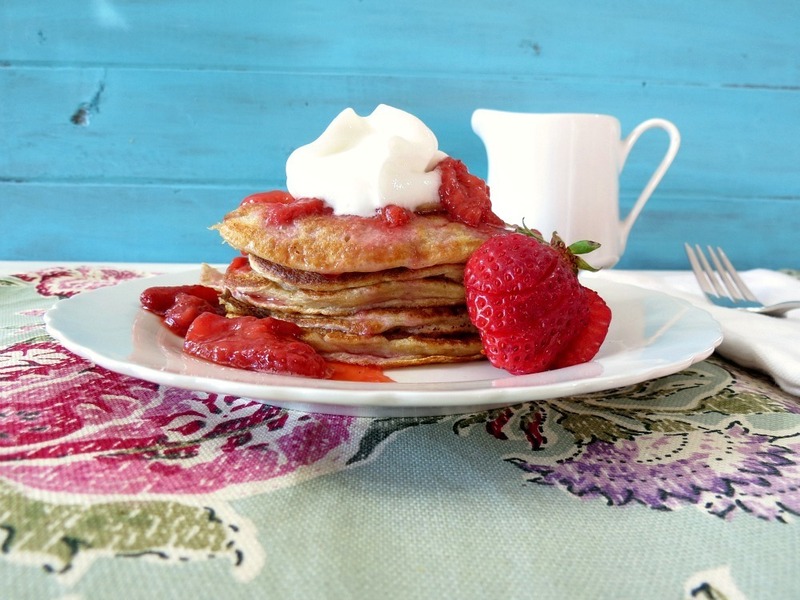 Lots of great ingredients in this pancake recipe. This recipe looks awesome! Oh my gosh. And your photos are beautiful! Thank you so much! Photographing food is hard, and I am still learning, you made my day with your comment. 🙂 Happy New Years! The pancakes look delicious! I remember Jackie…didn’t she have a show at one time? She is a really good trainer! Happy New Year!